I have grand ambitions of someday hosting a fancy, all-vegan Thanksgiving for my loved ones, but this year I’m keeping it simple — by skipping Thanksgiving altogether. I get Thursday and Friday off from work that week and I’m fully planning to enjoy my mini-vacation; it’s just not going to involve any feasting this time around. However, as the world #1 potato lover I don’t need a holiday as an excuse to make a big batch of garlicky vegan mashed potatoes, so here we are. Everyone has their mashed potato preferences. I like to use Russet potatoes in mine because texture-wise they’re very forgiving and have less tendency to turn pasty. I don’t have a ricer or food mill but instead use a handheld potato masher (the sort like this). This results in mashed potatoes that are nice and fluffy, with no big lumps but still a little bit of chunkiness and texture to them. I also don’t peel my potatoes because I’m lazy and don’t mind eating the peel. However, the Russet potato peel tends to stay in bigger pieces that aren’t as attractive as little bits of lighter potato peel, so if you’re concerned with appearances you might want to take that extra step with these. In general, please use your favorite potato variety and technique! These vegan roasted garlic mashed potatoes are oil-free despite being incredibly rich and creamy. It’s all thanks to the power of cashews! I blended a bunch of raw cashews with two entire heads of roasted garlic until super smooth and then folded it into the mashed potatoes. Aside from that, all you have to do is season to taste with salt, pepper, and maybe some green onions or chives if you like. The roasted garlic flavor can be tasted in every bite, but is delicate rather than overpowering. Make sure to use plenty of salt to get the seasoning just right.. and enjoy! 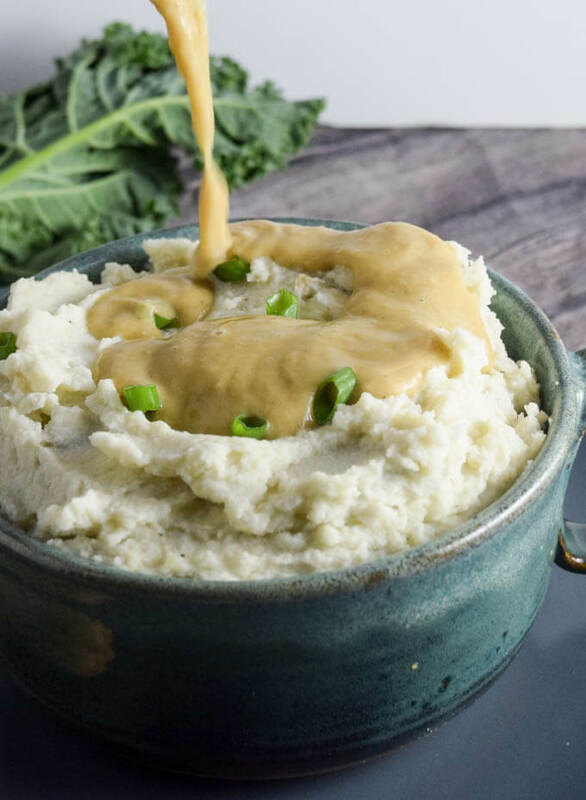 I served my roasted garlic mashed potatoes with homemade vegan gravy that’s secretly made with white beans! I think that might technically make this a complete meal ;). The gravy doesn’t require any roux, starch or flour, instead being thickened by a puree of cooked cannellini beans. I did use (and recommend) oil for browning the onions, so if you’re concerned with this whole dish being oil-free use an alternate gravy recipe instead. 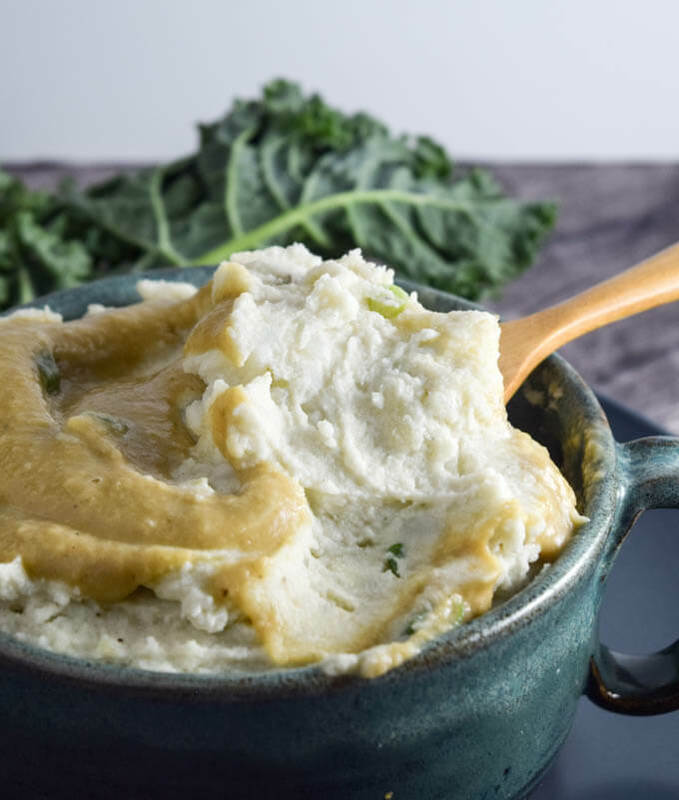 These mashed potatoes are omnivore-approved and undetectably vegan! Give them a shot and let me know what you think. 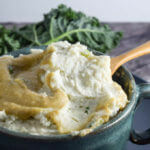 Or, if you’re looking for a more streamlined “classic” recipe, check out my super simple vegan mashed potatoes. 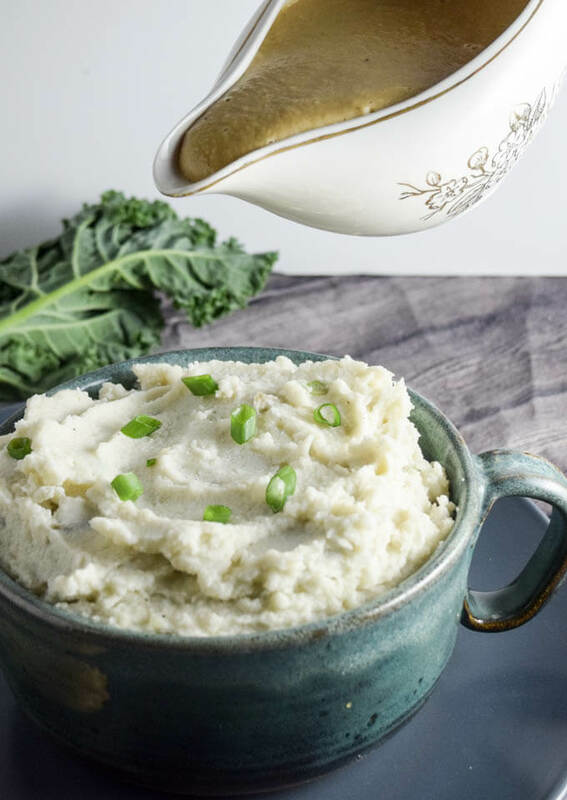 Ultra creamy vegan roasted garlic mashed potatoes that have no added butter or oil, take only 3 main ingredients to make and are omnivore-improved! Add the potatoes to a pot with cold, salted water. Bring to a boil and cook until completely tender, around 20 minutes. (I make the cashew mixture in step 2 while I wait). Drain the potatoes, reserving the cooking water, and mash them well with a potato masher. In a blender or food processor, combine the raw cashews and roasted garlic cloves with 1/2 cup of reserved potato cooking water. Blend until completely smooth, stopping occasionally to scrape down the sides with a spatula. In a food processor, this could take a few minutes to get smooth. Add a little more water if needed to help blend. Add the cashew and garlic mixture to the mashed potatoes, and use your spatula to fold it in until combined. Season with additional salt and pepper to taste (I find that it needs a good amount of salt). Serve hot with gravy or toppings of your choice. HOW TO ROAST GARLIC: Use your method of choice. Here's one method for oil-free roasted garlic and another that doesn't use aluminum foil either. MAKE AHEAD: Roasted garlic and roasted garlic cashew cream can be made ahead of time. Bring it to room temperature or warmer before adding it to the potatoes. 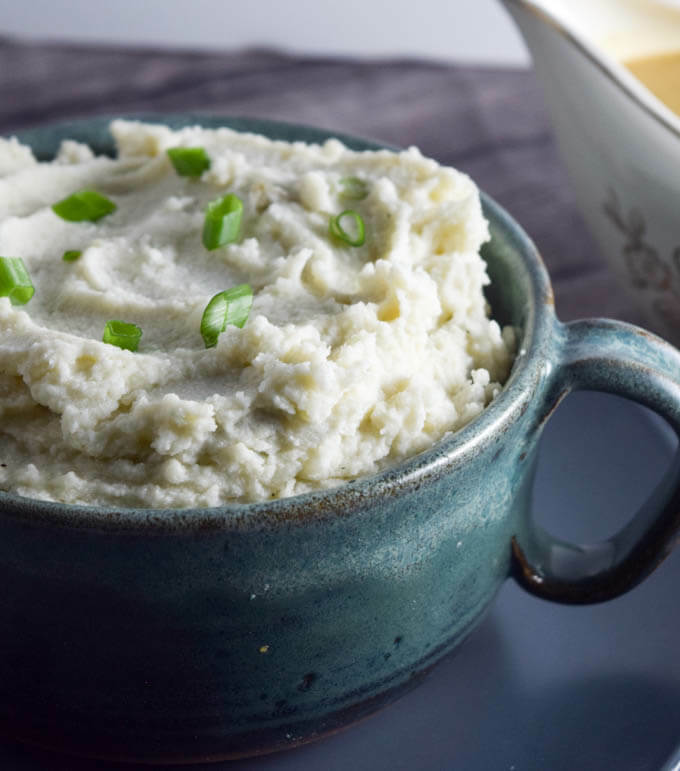 Leftover fully-assembled mashed potatoes reheat pretty well with a splash of water or nondairy milk added to loosen them up. (A touch of olive oil also helps if reheating, but of course, they would not be oil-free anymore). NUTRITION: Nutrition information is for mashed potatoes without gravy or toppings. Inspired from this non-vegan Food Network recipe. Reminiscent of turkey gravy. Made it for dinner. I’m fairly new to WFPB, and some of the vegan recipes I’ve come across have been more than a little weird. I was hesitant to try this, but it’s pretty great! Next time, I might add a little sage or poultry seasoning and serve it with some chik’n seitan. Thanks! I made only the gravy from these to serve with some roasted mushrooms that I harvested. I’m looking forward to trying the potatoes too since the gravy came out so delicious! Really nice to not have to deal with browning any flour and get more nutrition from it too.